Alpine Valley Resort, one of Wisconsin’s largest ski resorts, is located off of Interstate 43, just west of Highway D and Townline Road in East Troy. Skiers from beginner to expert will find plenty of fun in the snow, with features such as alpine skiing, night skiing, 10 kilometers of cross-country trails, snowshoe trails, and a terrain park. Alpine Valley Resort offers 388 vertical feet and 90 total acres of skiable terrain. With an average of 80 inches of snowfall per year, and snow machines ready to provide what nature doesn’t, there’s plenty of snow to go around. Alpine Valley offers 16 total lifts, including one wonder carpet, five surface lifts, three double chairs, five triple chairs, and two high-speed quads. In addition, Alpine Valley features 20 different trails, with their longest run spanning 3,000 feet. Difficulty levels range from green circle to black diamond, in a 40/40/20 split. Alpine Valley Resort offers on-site lodging, with a European motif. Their facilities are full-service, and include 123 guest rooms, four suites, dining rooms, a cocktail lounge, and an indoor pool and whirlpool. Individual room amenities include coffee makers, alarm clocks, and satellite TV. Accommodations are also reasonably priced, ranging from around $50.00 to $150.00 per night. Visitors to Alpine Valley can enjoy dinner at the Alpine Dining room or drinks in the spacious, recently-remodeled Valley View Lounge. The Alpine Valley Resort is a convenient Wisconsin ski resort with a European flair. With inexpensive accommodations, available lessons, rental equipment, and ski schools like the Kinder Kids, Adventure Kids, and Adventure Riders classes available, Alpine Valley is a great Wisconsin ski resort destination for families. The Rock Snow Park is Hiring! 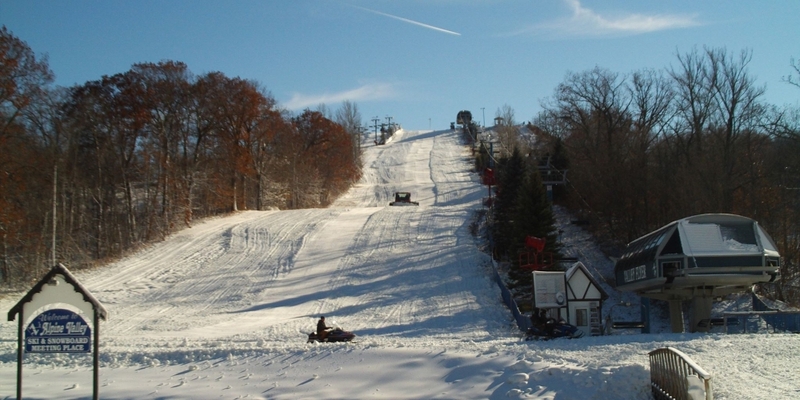 Ski Wisconsin is a resource for downhill skiers and snowboarders.